Like much of the industrial North, Leeds knows its beer. From Tetley’s early beginnings, real ale has practically run through the city’s canals and waterways, until the trademark brewery’s sorry closure in 2011 saw a new wave of suppliers and drinkers wash up in the pubs and tap rooms. However, there is no disputing that Yorkshire has seen a micro-revolution over the past decade,and the craft scene here is so ahead of the curve that many of the producers now function without beards. There’s no better altar to the craft than Leeds’ vibrant Northern Quarter. Belgrave Music Hall, North Bar, The Reliance and of course BrewDog all stock an impressive range of colourful cans. Now there’s a new kid in town from the founders of award winning Friends & Ham, a card they’ve had up their sleeve for quite some time. “If you want to drink a really nice wine with dinner, this is the place to do it.” Anthony Kitching reflects, their new venture simply born out of a lack of high quality wine bars in Leeds. Inspired by the European delicatessen where you can try the bottle that you’re thinking of taking home at the bar, and pick up quality produce for your trolley while you’re at it — que bello! 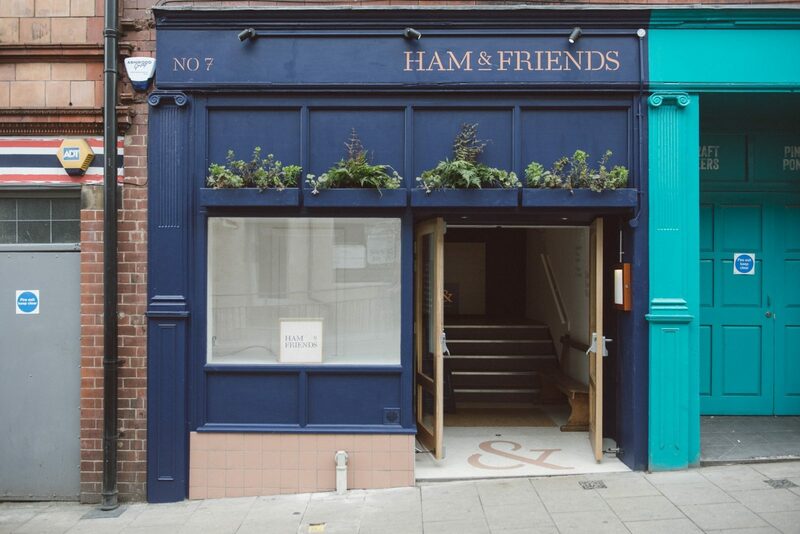 With this in mind, two years after the site’s landlord approached Kitching and his wife (now dubbed the Duke and Duchess of ham), and five years of Friends of Ham satiating residents and commuters’ appetites with craft and charcuterie, their new establishment opened on Merrion Street. This is Ham & Friends; confusingly similar to the duo’s initial concept, where the conjunction alters and the meat comes first. 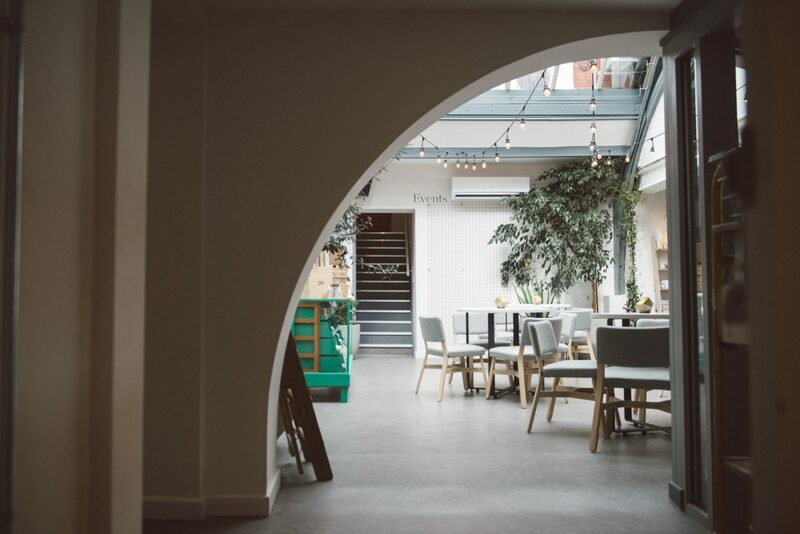 Still bring your friends though, as this place could not be more social; with Yorkshire Wine School upstairs and a kitchen that encourages a sharing table of uber on-trend small plates. With tons of natural light spilling in from the mezzanine windows, you can browse a collection of over 200 wines, many of which are organic and focus on natural and biodynamic processes. Murals from local artist Claire Bentley-Smith depict some of the small scale artisan producers that Ham & Friends showcase so brilliantly. 60% of the wines stocked you won’t find anywhere else outside London, and thanks to residents George & Joseph, the same goes for their range of cheeses in the area too. Overheard in their dedicated walk-in fridge, at a precisely controlled fromage friendly temperature, were plans to provide tables with mini racelette machines in the winter, featuring their rather special unpasteurised Ogleshield. The retail space is beautifully curated, With Hobo soy candles, ceramics from Scandi inspired Enklehed, and lambswool McNutt throws: Ham & Friends speaks to your lifestyle as much as your stomach. From the deli you can pick up an enticing range of smoked olive oils and balsamics, stuffed olives, salami and Pump St chocolate. Local favourites like Leeds Bread Co-op loaves and Northern Bloc ice cream nest along side Spanish paprikas and those incredible Torres black truffle crisps. Theres even a DIY bacon curing kit; it’s a real picnic or Christmas hamper destination. Their passion for quality wine really translates. The knowledgeable staff, many of whom hold qualifications from YWS above, encourage customers to interact with it. Wines by the glass change daily, and 50ml flights are available so you can sample something new, removing the stuffy formality attached to the bottle. What’s pretty neat is how you can buy any of the wines they sell in the shop, add a £10 corkage charge, and drink it downstairs at your table, thus avoiding the crazy margins restaurants often add to the menu. Try the the Australian Bonkers red, a unique blend of grape varieties, that’s light and tropical on the nose, and similarly to H&F’s range of orange wines, goes well with both meat and fish plates. So, let’s talk about the food. A must try is the Iberico pork secreto, traditionally the butchers secret off-cut, here deep fried in a peppery batter and served with homemade relish: the most perfect and porky take on KFC you’ll ever have. Similarly rich are the pigs cheek blanquettes, or the cream of Jersey royal soup topped with Mrs Kirkham’s Lancashire cheese and crispy onions. On the lighter side they have a Whitby mackerel escabeche plate, and a citrussy shaved fennel and dill salad – one of the sides in fact from their dedicated Vegan menu. This alongside the incredibly tempting brunch menu, changes weekly, a further credit to head chef Joel Monkman’s focus on provenance and seasonality. If you’re in to gnocchi, try his Old Winchester dumplings with caramelised cauliflower and hazelnut pesto, a real star. Now what did I say earlier re small plates? Very of the moment, very a la mode. And I get it – we’re greedy, we’re indecisive, keen to conjure up reminiscences of sun drenched evenings on the Algarve where the tapas is as endless as the Brit studded beaches. Sharing does circumvent that customary dish envy, avoids wandering forks, and makes your table ever so grammable, but sorry, I’m slightly over it. I know what I want and I want to clear my plate. Call me a millennial, but when I consider exploring the snack cupboard on the way home, something’s a miss. Look, I’m a pig, and Ham & Friends can sling me up to that butchers hook and cure whatever secreto’s they can get their hands on. This is a gorgeous spot to meet for drinks and nibbles, and I will certainly be coming back for brunch. The desserts I felt, needed a little polish, but it is still early days for the team’s latest addition to a burgeoning independent scene. As artisan credentials go, Ham & Friends are truly up there, proving that it is possible to design a venue of this kind in the city centre, and I applaud their attention to detail and desire to make top quality wine more widely accessible. Look out for speciality events including Ham Carving with Brindisa, Chocolate Making with Tyto Leodis, Food Styling/photography workshops as well as monthly wine and cheese clubs.